Disaster struck today, no not the baby bonus being abolished in the budget so we can’t look getting a new TV when we pop out a nugget, Tbetta’s computer died halfway through the Bullets. He took to Twitter tonight to give us a 140 character style. Here are the tweets! Disaster struck today, no not the baby bonus being abolished in the recent budget so we can look at getting a new TV when we pop out a nugget, Tbetta’s computer died halfway through the Bullets. He took to Twitter tonight to give us a 140 character style. Here are the tweets. 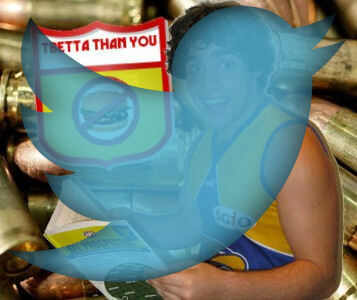 Be sure to follow @Tbetta9 on Twitter for his awesome insight into AFL Fantasy and a whole lot more! #TbettasBullets Polling: 3 Votes: Dangerfield (141). Absolutely killed me since I traded him out with 2x 140+ scores. Is he back for good? #TbettasBullets Polling: 2 Votes: Defender Tiger cubs. Both Vlastuin (101) & Ellis (128) going above and beyond the call of duty this week. #TbettasBullets Polling: 1 Vote: Moloney (110). Been sneaky good this yr, averaging 91 as a MID unique. Sideways to Priddis with $ to spare. #TbettasBullets Trolling: 3 Votes: Hartlett (37). Great pick until he attracted the tag. Funny stat – has only scored 100 – 120 or under 40. #TbettasBullets Trolling: 2 Votes: Portlets. Annoying that Wines (54), Stevenson (46), Heath (33), Neade (24) all max their BE in same week. #TbettasBullets Lessons: Swan no longer a lock for 'C'. Very consistent (only guy to top 100 each week), but haven't seen same huge celing. #TbettasBullets Lessons: We can be ruthless with 44 trades, but not stupid. Case in point – cut loose Greene (win) and Danger (loss). #TbettasBullets Lessons: Not rocket surgery – Port players will score well when they win, poorly when they lose. I'm tipping more losses. #TbettasBullets Uniques: Was going to look at a few unique players (under 5%, at lkeast 3 games) worth considering going forward. #TbettasBullets Uniques:Duffield, DEF, $426k, 86avg. Like his loose role, has a low of 81 in last 4 games. Big help with this back carnage. #TbettasBullets Uniques: Ibbotson, DEF, $405k, 112avg. Massive risk, feels like another Westhoff. 136 in Round 7 says he could be handy. #TbettasBullets Uniques: Zaharakis, MID, $480k, 91avg. Probably better value options out there, but has avg'd 115 in last 3. Great POD. #TbettasBullets Uniques: Masten, MID, $497k, 102avg. Been very under the radar. low of 93 in L5, knows how to find the footy but no frills. #TbettasBullets Uniques: Stokes, FWD, $444k, 97avg. Low of 86 when not sub, has a cherry-picking role & will continue with Chappy/Kelly out. #TbettasBullets Uniques: Harvey/Wellingham. Wait til the Magic Number lowers their prices, then consider. Harvey aging but Sharrod in prime! #TbettasTweets Trade Centre: Griffin OUT Goldtsein IN. Still best value at $421k (assuming already have Leuey). Has topped 85 in 5/7 games! #TbettasTweets Trade Centre: Portlet OUT Priddis IN. Absolute steal at $393k (equates to roughly 79 avg). Hasn't avgd less than 93 in 4 yrs! #TbettasTweets Trade Centre: Sierakowski or Thurlow? I like Thurlow but will be gone once Rivers fit. Siera weak JS but better than nothing. #TbettasTweets Trade Centre: Buddy as cheap as $370k in a fortnight?! If he gets his act together, absolute bargain. Easy run coming too. #TbettasBullets Trade Centre: N. Riewoldt…. Wow. Did not see this sort of season (111 avg!) from him for the aging Saints. Top 6 fwd ATM. That's it from me guys! Look forward to #TbettasBullets in its usual form at @DTTALK next week (technology permitting). Good luck for Rnd 8! Massively awesome work to @Tbetta9 for giving us our fix of the weekly bullets. Superb write up as usual, sold me on Wines to Priddis. This may become the new format. Where theres a will theres a way. thanks tbetta. I think rivers will be out for a while so thurlow could be good for atleast the next 4 to 6 games ready to cull for a premo. Love the new format Tbetta, hahaha. I was going to dump the same 2. Now that Pittard has already been ruled out, I’ll drop Pittard and keep Stevenson on the bench. Wines for Priddas however. Originally had Scooter in but thinking why not get Priddis and pocket 200k? Every single time I am rude. Well done to still do this Tbetta considering the circumstances! Seems like overkill saying it that way (involving DPP) when really its just Wines to Priddis and Hartlett to Ellis. Solid choices, I just wish not everyone saw the value of Priddis but I guess when you will end up with a Swallow, Selwood, Cotchin etc from a start of Wines for 2 trades and very little money needed its a no brainer. Great info mate! Love the effort made via twitter given the crisis. Chopping block for me this week is Knights, Hartlett and Wines. Leaving me next week to go Knights > Franklin… Thoughts? GAJ, N Riewoldt, J Watson or L Franklin. I’m leaning heavily towards the sweet merciful one (cause he’s GAJ and it makes me feel warm and fuzzy seeing his little peanut head in my line-up), but Riewoldt has the lower BE, and L Franklin at 400k is almost impossible to pass up, especially with him playing GWS. I’m thinking Watson is another week from bottoming out, but I’m also a bit nervous about bringing him in with the whole peptide scandal thing. Not assuming guilt here, but how big a risk do people think it is for JW to get rubbed out this season? Is it as pointless as worrying about whether someone will or won’t do an acl, or is it a realistic worry? I wouldn’t worry about Jobe getting rubbed out for the season.. Buddy is also another week from bottoming out. You would have to go with Ablett over anyone if you don’t have him. Thanks XPL. I’m going with that one. I just can’t tolerate not having Ablett in my team any longer I think. What are people’s thoughts re bringing Dusty in at current price $488k? Not sure with Dusty, last time he smashed out a big score he backed it up with a pissweak score. Statisically wise, that 58 is a bit of an outlier. If you look at the season as a whole, he is averaging well over 100. 98% sure I’ll be taking the punt on him this week. Dustin martin, Deledio, or Other? Already got; Jobe, Gaz, Dangerfield, Pridis, Daisy, cotchin, o’meara, evans, vlastuin. Hodge for mine, better kick:handball ratio. priddis is MUCH more consistent tho..